Welcome back to the Waiting on...Wednesday link-up - a place where you can link up what you are waiting on, going through, making, anything - as long as it's family-friendly! :) After you link up, please make sure to read a few others - and don't forget to tell them you found them at Waiting on...Wednesday! 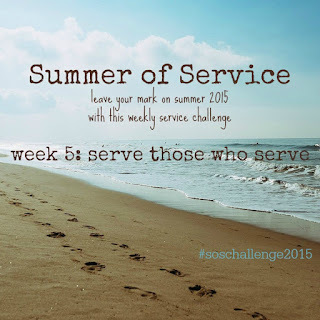 Before we start the link party, I would love for you to visit my summer service challenge - Summer of Service! A weekly challenge that you can complete on your own or with your kiddos. 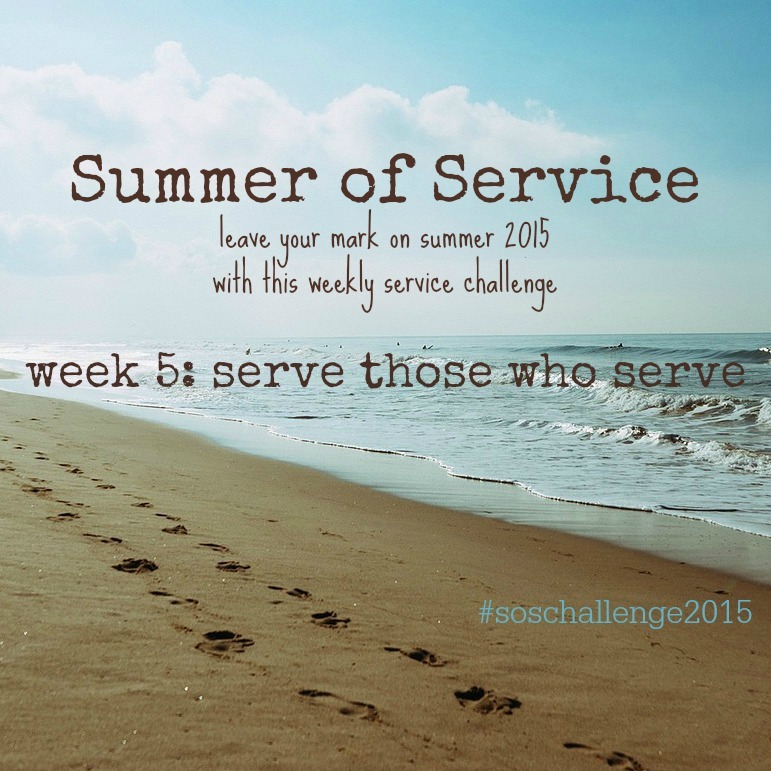 This week focuses on serving those who serve. And now to the party!!! Last week we had our highest number of posts! You guys are amazing!!! Lots of returnees (thank you!) and some new faces too. Welcome!!! I'm so glad you're here! But, sadly, I didn't get a chance to read through all of them. I'll catch up this week and post two weeks of features next week - sorry about that! Having you link up means so much to me and I want to make sure I'm reading and commenting on your posts. Thanks for understanding! Follow Holly @ While I'm Waiting...'s board While I'm Waiting - Waiting on...Wednesday link-up party FEATURES! on Pinterest. *All topics are welcome - as long as they are created or written by you and are family friendly! Old posts - new posts... it's up to you! Please link to your specific post URL and not to your blog home page. *You can link up to three posts/blog. *Please place a link back to this link-up in either your post or on your party page so that others can link up too. *It's a party, try to visit at least 2 other posts and show them some love! This is the fun part! Be inspired, inspire someone else - don't just link and run! Leave comments (and tell them you found them on Waiting on...Wednesday! ), share and pin their posts - you know, show some love! *Each week I'll choose a few posts to feature at the next link party. I'll also pin the featured posts to the While I'm Waiting - Waiting on...Wednesday link-up party FEATURES Pinterest board. *If you would like to follow me, that would be awesome but it's not required. So, grab the graphic, link back to While I'm Waiting... and share away! And then prepare to be inspired, encouraged, and entertained! What am I waiting on? I can't wait for the 4th of July! For the past few years (except for last year!) our neighborhood has hosted a little parade to kick off the day. We decorate scooters, bikes, wagons, golf carts - basically anything that rolls and wave the red, white, and blue! Here's a few pictures from previous July 4ths! I'm so glad you stopped by! I hope you and your family have a fabulous 4th of July! Thanks for linking up! Have a blessed day! Gig 'em and God bless! NOTE: By linking up you are confirming that you own the rights to the photo you are using in your post or that the photo is in the creative commons/public domain. By linking up, you are also giving permission for your post/photo to be used for promotion or highlighted as a selected feature on While I'm Waiting. All featured posts will be linked back to their original page. Hi Holly! Thanks for hosting! Hope you are your family have a great 4th of July! Thanks for linking up, Alexis! Hope you have a great 4th too! Your kiddo are adorable and what a nice job decorating their "floats." Happy Fourth of July to you and enjoy that parade! Thank you, Michelle! It's something that we all look forward to! Hope you and your family have a wonderful holiday weekend! Thanks for linking up! Love looking back at these sweet July 4th pictures! I was looking through mine this week and we sure have spent lots of July 4th's together. It just doesn't seem like it's been that long but the bigs look so little in the majority of these pics! Wish we could be together this 4th - just doesn't feel like the 4th of July without spending it with you guys! Holly, thanks so much for the linkup! Have a blessed 4th of July! I love the photos! You are so welcome, Donna! Thanks for linking up and have a great 4th of July! Oh, my! You guys got bigger and better every year with the parade! I love it!! Hehe, Laura! You know it! :) It's a fun morning spent with neighbors - perfect start to our holiday weekend! Hope you guys have a great 4th! I really want our neighborhood to start something like this!!!! I guess I need to be the change. :-) I can't wait to see what you have in store for this year!!! If anyone can make it happen - it's you! You are awesome at getting people together! Hope you and your family have a fabulous 4th of July weekend! I am so glad that HOA brought back the parade. What a fun 4th of July tradition! Me too! I was so sad when they cancelled it last year! Hope you guys have a great weekend! Cuteness overload! Beautiful family! Happy 4th and thanks for hosting the party each week. Blessings! Thank you, Jas! And, thank you for linking up! I really appreciate you! Have a great day! How nice that you have 6 years worth of photos for the Fourth of July! I hope the parade comes back, clearly you guys love it. Have a great Fourth this year! We've only missed two parades since we moved to our neighborhood - one year we were in NYC/DC and then last year when they cancelled it. It's so much fun! We can't wait till Saturday morning! Hope you and your family have a wonderful weekend! Your fourth of July looks, so, so fun!!! Such sweet little faces with you at the parade too. Fun, fun fun! xo! Thank you, Katelyn! It's always a fun day! Thanks for stopping by! Hope you are having a great day! I love the pictures, Holly. I have fond childhood memories of 4th of July parades. The ones around us now just aren't the same. Thanks for being a faithful host. Thank you for your sweet words, Abi! I'm hoping these memories stick with our kiddos! Happy 4th! Great to receive your invitation again this week - bit late checking in though. Hope everyone has a great party. Happy to have you, Isobel! Have a great day! Awe look at how little your babies were! So cute! As usual, thanks for hosting. I love seeing so many people link up here! It truly feels like yesterday looking back at these pictures! I can't believe how little my bigs were just a few short years ago!!! Thanks for linking up! Wednesdays have quickly become my favorite day of the week - so many great posts!!! I'm super grateful for everyone that links up! Hope you have a wonderful 4th of July! Holly, please remember you are only one person and you have a family to take care of as well. I'm sure everyone understands that as your link up is growing that you may not make it through them all. If you don't plan to have any co-hosts, you may want to consider only allowing one post per person...did I just say that? :) Don't take on too much okay! Love the over-the-years pics of your kids for 4th of July. I'm so glad your HOA has decided to add this back in because it sounds like a lot of fun. Can't wait to see your pics from this year's event. Have a GREAT weekend! Thank you, Lowanda! Great, great advice! I think next week I'll change from three posts to two (baby steps!). I just never thought the link-up would grow so fast! I love hosting it but want to make sure that I can still visit all those who come. Thanks again for your encouragement! I appreciate it so much! Hope you and your family have a wonderful 4th of July! so glad the parade is back! Last year our parade got cancelled because of a hurricane, hoping for better weather this year! Thanks for hosting!!! I am loving your challenge! Me too!!! I can't wait! I hope you guys get your parade in this year - they are so much fun! And, I'm loving your photo challenge! Great idea!!! You are doing a GREAT job! I love the pictures of the past! So cute. I can't wait to see them this year. Thanks for hosting once again. Thank you, sweet friend! I'm happy to host - appreciate you guys linking up each week! Means the world to me! I hope you guys have a great 4th of July! That parade sounds like so much fun! Do the kids feel like celebrities? I was in a parade one year with the Girl Scouts and I felt like I was famous. :) Hahaha. The kids love it! We always laugh - definitely WAY more participants than spectators! :) It's still fun and we can't imagine starting the 4th without the parade! Hope you guys have a great one! Thanks for stopping by! Awww! I love this idea! What a fun event! I might have to borrow this idea for our neighborhood! Adorable! Thanks, Sara! It really is a lot of fun!!! Loved the family day designed by Holden! Thanks! I was impressed by how much thought she put into planning it! It was so much fun! Thanks for stopping by! Happy to have you here! I wish our neighborhood did a parade, those floats all look amazing! Thanks for linking up with us! You could organize it for next year, Liz! They are SO much fun and it really brings the neighborhood together!